Composite centralizer is used during running and cementing operations to centralizer casing. Casing Composite centralizer is used during running and cementing operations to centralizer casing. 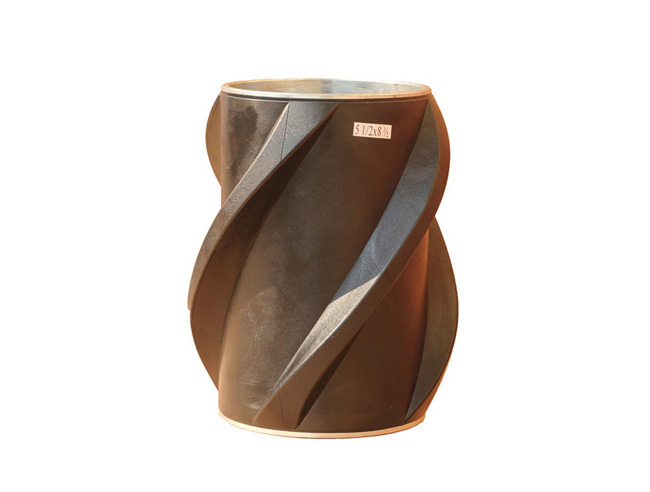 Made of advanced composite, the one-piece centralizer has a low co-efficient of friction, it is heat resistant and highly durable which greatly enhances cementing operations. 1.Spiral Vane Roller Composite Casing Centralizer consists of rigid body, on which machined spiral blades. 2.There are made of advanced composite that has low coefficiency of friction, it is heat resistant and high durable, fully heat treated rollers fixed on each spiral blades. 3.Because of rigid body and rolling friction between the rollers and inside of well or casing. 4.The capability of the Casing roller Centralizer is better than others of all.Casing Roller/Wheeled composite centralizers are mainly used for big high Roller, high deviated wells and horizontal wells, to centre casings. 5.Casing Roller Composite Centralizers can also remove wellbore cake and improve mud replacement efficiency etc. 6.Roller Composite Centralizers provide superior wear resistance and have been proven to remain functional throughout the life of the well and can aid in casing/tubing retrieval. 7.Precision-machined inside diameter fits over the casing through the complete API tolerance range, providing excellent rotational performance in mud. 8.When running casing through open hole, the system’s smaller roller-contact area reduces the risk of differential sticking and maintains standoff . 9.The roller/axle relationship ensures that axle shear stresses remain within elastic limits, preventing permanent deformation. 10.Axles are crimped in place, eliminating the welding process, while ensuring the rollers cannot break free and fall into the wellbore. 11.The system’s high-quality construction materials improve high-pressure/high-temperature capabilities. 12.Roller Composite Centralizers are available in sizes 4-1/2" to 20". 13.Any special sizes are available on request.